08/2014: I will join Florida International University, as Assistant Professor on Aug. 19, 2014. 08/2014: I will be the managing guest editor of a special issue in Computerized Medical Imaging and Graphics, on the topics of Sparsity Techniques in Medical Imaging. 07/2014: I am co-organizing the 2nd International Workshop on Sparsity Techniques in Medical Imaging in conjunctin with MICCAI this year at Boston, MA on September 14th, 2014. The keynote speakers are Dr. Yoram Bresler and Dr. Daniel Rueckert. 05/2014: I will join the School of Computing and Information Sciences at Florida International University located at Miami, Florida, as tenure-track Assistant Professor starting from August 2014. Fully-sponsored Research Assistant position available. Please contact me via e-mail if interested. 6/11/2014: I passed my PhD Dissertation Defense. My thesis work is entitled "Towards Robust Medical Imaging: Sparsity-Based Perfusion Deconvolution". Thanks to my thesis committee members: Tsuhan Chen, Ramin Zabih, Noah Snavely, Pina Sanelli. 06/02/2014-06/04/2014: I gave an invited talk entitled "Medical Image Analysis in Assessment of Treatment Response and Disease Progression" and attended the panel discussion at the 2014 IEEE 4th International Conference on Computational Advances in Bio and Medical Sciences (ICCABS), Special Session on Radiation Oncology, held at Miami, FL. 05/22/2014: One paper accepted by MICCAI. Our paper has won the MICCAI Student Travel Award! 05/07/2014: I gave a talk at the Biomedical Imaging Research Seminar organized at Weill Cornell Medical College on "Towards Safer Medical Imaging: Sparsity-based Perfusion Deconvolution". 04/25/2014: I am awarded the Hsien Wu and Daisy Yen Wu Memorial Award 2014! This is in recognition of the excellent progress in the academic program and high potential for a successful academic career (5 awardees out of 19 applicants). 01/2014: I gave talks entitled "Sparse Deconvolution" at the Department of Biomedical Engineering and Instrument Science of Zhejiang University and Med-X Research Institute of Shanghai Jiao Tong University, about our research on robust low-dose CTP deconvolution. 10/2013: Our paper Improving Low-Dose Blood-Brain Barrier Permeability Quantification Using Sparse High-Dose Induced Prior for Patlak Model has been accepted by Medical Image Analysis. On the left is the 5 minute AudioSlide presentation for this paper. 09/2013: Our paper Towards robust deconvolution of low-dose perfusion CT: Sparse perfusion deconvolution using online dictionary learning is recognized as one of the top 25 hottest papers in Medical Image Analysis in 2013 from April to June. The ranking includes all the previously published papers in Medical Image Analysis. This is the project page of our work on robust perfusion deconvolution. On the left is the poster presented at MICCAI 2012. 06/2013: I visited Xia'men University and gave a talk to the Computer Science Department on our robust low-dose CTP deconvolution using dictionary learning (full paper in MedIA'13 and MICCAI'12). 05/2013: One paper accepted by ICIP'13 on kinship classification by modeling facial feature heredity. This is the project page of our work. 04/2013: We contributed a talk at the Special Session on Sparsity Techniques in Medical Imaging at ISBI'13 (San Francisco). 05/2012: One paper accepted by MICCAI'12. 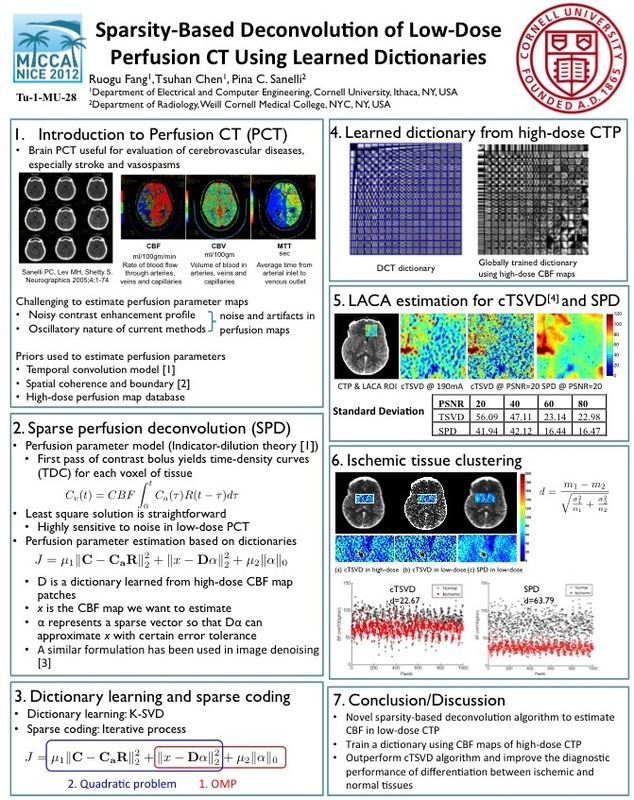 This is the work on robust deconvolution of low-dose CT perfusion using online dictionary learning. This is the project page of our research. 11/2012: Passed my A exam. 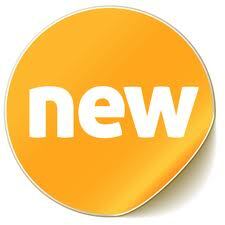 Thanks to my committee members: Tsuhan Chen, Ramin Zabih, Noah Snavely and Pina C. Sanelli. 04/2012: Presented our oral paper at ISBI'12 (Barcelona). 01/2012: Our paper Sparsity-Based Deconvolution Of Low-Dose Brain Perfusion CT In Subarachnoid Hemorrhage Patients was presented as oral presentation at ISBI'12. 12/2011: Facial recognition software spots family resemblance. Our kinship verification work is reported by NewScientist. The news describes our work on using 22 facial characteristics which, based on literature in genetic and cognitive science, seemed likely to be hereditary and find the optimal combination of facial features that can give the highest accuracy. 09/2011: Finished my summer internship at Kodak research labs, mentored by Alexander C. Loui. We're working on the kinship classification using facial feature heredity on large scale multi-generation families. 10/2011: Our paper Radiation dose reduction in computed tomography perfusion using spatial-temporal Bayesian methods is accepted by SPIE'12 on Medical Imaging. 07/2011: Our paper Segmentation of Liver Tumor Using Efficient Global Optimal Tree Metrics Graph Cuts is accepted by MICCAI'11 Workshop on Computational and Clinical Applications in Abdominal Imaging with oral presentation. 12/2010: My article A Tale of One Town and One City on my experience as a visiting research graduate student at Weill Cornell Medical College in New York City appears on Cornell Daily Sun. 08/2010: Finished my summer internship at Siemens Corporate Research, mentored by Leo Grady. We're doing research on the Interactive Segmentation On Mobile Devices In A Cloud Computing Environment with US patient. Ruogu Fang is a PhD student in the Department of Electrical and Computer Engineering at Cornell University, NY. She has received her B.E. degree in Information Engineering from Zhejiang University, China in 2009, M.S. degree in Electrical and Computer Engineering at Cornell University in 2012 and is expected to graduate with PhD degree in Electrical and Computer Engineering in 2014 from Cornell University. Her advisor is Dr. Tsuhan Chen. 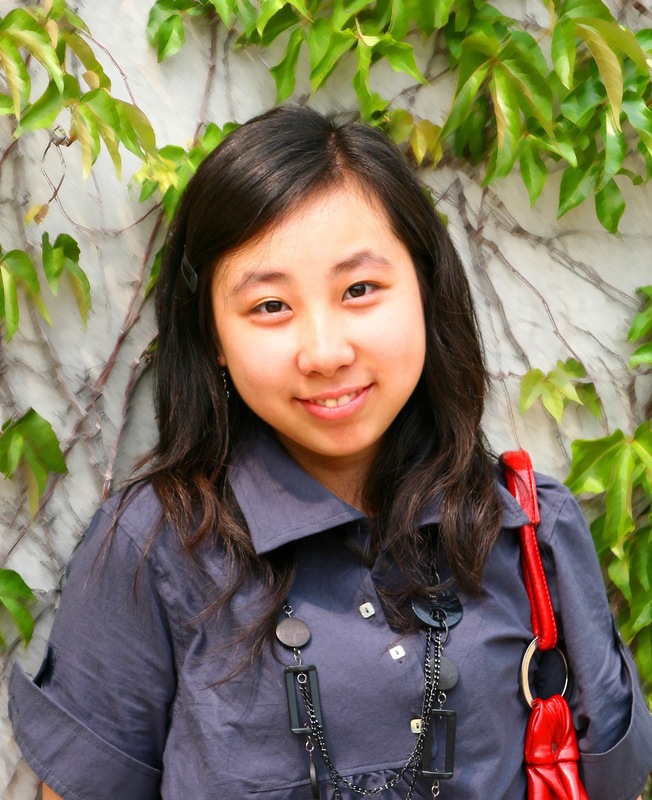 She is interested in designing robust and adaptive image data restoration and denoising algorithms and applying them to solve healthcare and computer vision problems. Jocobs Scholar Fellow, 2009-2010, for students who exemplify strength and potential in academics, service, and leadership with an expressed interest in using engineering education for the betterment of society.